While everyone’s attention was on a head and shoulder pattern completing on the Standard & Poors 500 index, another head and shoulder formation was taking place in gold. As the magical $1000 marker acted as strong resistance several times, a consolidation pattern emerged below it. While head and shoulder formations are usually considered to be reversal patterns, they can also act as continuation patterns. This is less common and fewer technical analysis students know about it, which makes it more likely to complete. As we’ve all noticed by now, the head and shoulder formation in the equity indexes was noticed and watched closely by everyone and their uncle. Which is why it turned into a bear trap. The other possibilities are that we could get an irregular head and shoulder pattern. This is a variation where the shoulders are not symmetrical. For example, we could have two shoulders form in the right hand side. The whole pattern would still be valid but it would take longer to play out. Also, we could see a sideways trading range which would then suggest a large cup and handle pattern instead. Either way, if the price of gold continues to trade within a short distance from the $1000 resistance, the probability of it breaking up increases. According to the K-ratio, the best time to buy gold stocks was in late October 2008, when they were almost as cheap as they were back in 2001. Of course, we now know the 2000-2001 era as a generational opportunity to buy gold - just as the majority were preoccupied with the technology sector. You can also see that the 200 rate of change for the ratio was confirming the buy signal. Right now they are both in neutral territory. This presents a bullish opportunity because if the price of gold breaks through the long term resistance, the K-Ratio still would have room to move up before becoming overbought. You can still get in on FREE week over at EWI’s commodity junction. All you need is an email to get in - but do it right now because it is only available til July 22nd. If you’re interested to trade commodities or are an experienced trader and want to learn about how Elliott wave analyses these markets, this is your chance to get a sample of their work for free. I didn’t know that! I actually thought H&S is not valid in a middle of a bull. 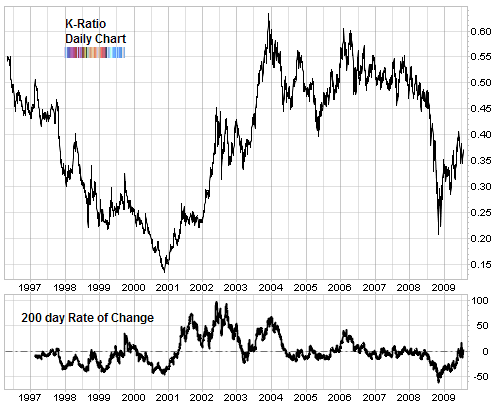 Babak, I went back in 2006 and read your article about k-ratio. To make it simple, looking at $HUI:$GOLD chart, what’s the best ratio to jump into gold stocks and what’s the best ratio to go out? The markets could do A, B, or C. Pattern X often signals that the markets will do A. Little known, however, is that it could also mean the markets will do B or C.
A couple of points, when you last commented on Gold, around $970, $980, you said that there was too much bullishness, and that this was a contrarian sell signal, what has changed in your view now gold is at $950? Secondly, EWI is very bearish on Gold, since they see deflation not inflation, so i thought your reference to them was strange given the bullish tone of the article. I remain bullish of gold, but find your comments a little confusing. I was a little concerned of the lack of conviction and support for gold during the last correction. Now it appears to be showing some resilience. 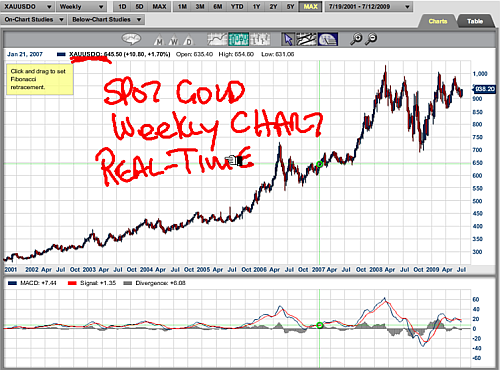 Take a look at the chart of US Gold. which charting package do you use?